Something often overlooked when it comes to defence ties is the fact that military-level exchanges pave the path for greater contact between some of the brightest minds of both countries. Today’s handover of the INS Vikramaditya to the Indian Navy is a landmark event for the deep-rooted defence relationship between the countries, which have faced their fair share of challenges in the recent past. Obviously the most talked about aspect of the defence ties between Russia and India is the fact that Moscow has never been hesitant to transfer the latest technology or military hardware for use by the Indian armed forces. However something often overlooked (and is mutually beneficial) when it comes to the defence relationship is the fact that the various military-level exchanges pave the path for greater contact between some of the brightest minds of both countries. A young Russian naval officer from the town of Artem, near Vladivostok, told me once about how joint naval exercises were his first proper introduction to Indian culture. After making close Indian friends, who he said were from the “same school of thought,” during a joint naval exercise, the man went on to learn Hindi and became deeply interested in life in the “exotic and distant land.” After visiting India four times, the Pacific Fleet officer has taken a particular liking for the temples and beaches of Orissa, which is at the exact opposite end of the country from the favourite Russian hotspot of Goa. He said he found the people in the state to be more traditional than in western and northern India. Such stories, which would have been more common in the 1970s, are definitely encouraging for the future of the Indo-Russian relationship. Since this bright officer has a great career ahead in the navy, in a few years, India will have yet another good friend at the higher echelons of the Russian security establishment. Similarly several Indian military personnel have a soft corner for Russia. At a heated debate on the sidelines of a seminar at the University of Mumbai last year, an Indian naval officer lost his cool when he heard some students criticising the Russian delay in delivering the Vikramaditya and in some bizarre manner equating that with India’s ageing Soviet-built fleet of MiGs. He asked one particular 20-year old self-proclaimed expert to talk a little bit in detail about the technicalities of the refurbishment of the ship, only to get a smile that indicated embarrassment. Seeing the passion with which he spoke about the Russian defence industry, I approached the officer for an informal chat. “The armchair critics read poorly written articles by misinformed journalists and then the TV channels jump all over this and many gullible people just swallow this information,” the officer told me. He was particularly angry at the way young people at that conference kept parroting the lines of some of the journalists, who he claimed had some sort of agenda. It turned out that the young man had been to Russia thrice and was trained on a frigate that was purchased by the Indian Navy. More than talking about the professionalism of his colleagues in his host country, the young man spoke about his life after working hours in Russia. “I had the time of my life,” he said, talking about how he was also able to take his family “to see a real winter” once. After his stints in the country, the officer also made it a point to enrol for Russian language lessons in his free time; something that he believes will help him both professionally and in his personal life. Residents of towns like Severodvinsk, where the Sevmash shipyard is located, are used to seeing Indians, mainly family members of Indian naval personnel temporarily based there. These civilians also take to Russian culture and customs with a lot of enthusiasm and enjoy their time in the country. 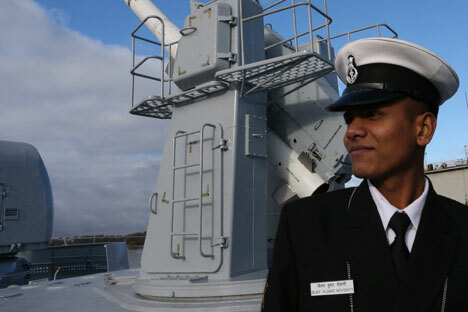 It goes without say that the family members of Indian naval officers become de-facto cultural ambassadors for Russia. The exchange of intellectual capital between the two countries has been heightened by joint ventures such as BrahMos and the Sukhoi/HAL Fifth Generation Fighter Aircraft. It takes a tremendous amount of trust at the highest levels for such ventures to exist in the first place and they in turn open up even more opportunities for people-to-people contact. Russia has in recent years has also realised that training foreign defence personnel is a great way of inducting them into the world of military hardware. Thousands of Indians have been trained over the last decade in Russia’s prestigious military academies. While an increase in the two-way flow of visits by ordinary citizens can bring Russia and India closer together, more initiatives to encourage exchanges and interactions in the armed forces will pave the way for even greater defence relations. Since the countries are focussed on joint development as the way ahead for the defence industry, cooperation is set of reach unprecedented heights in the coming years.